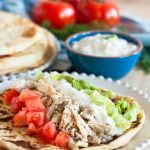 When time is short, but you need an easily customized healthy meal, make some slow cooker chicken gyros! So I plan easy meals, that I can prep in advance, and have ready somewhere between nap time, and swim lessons. 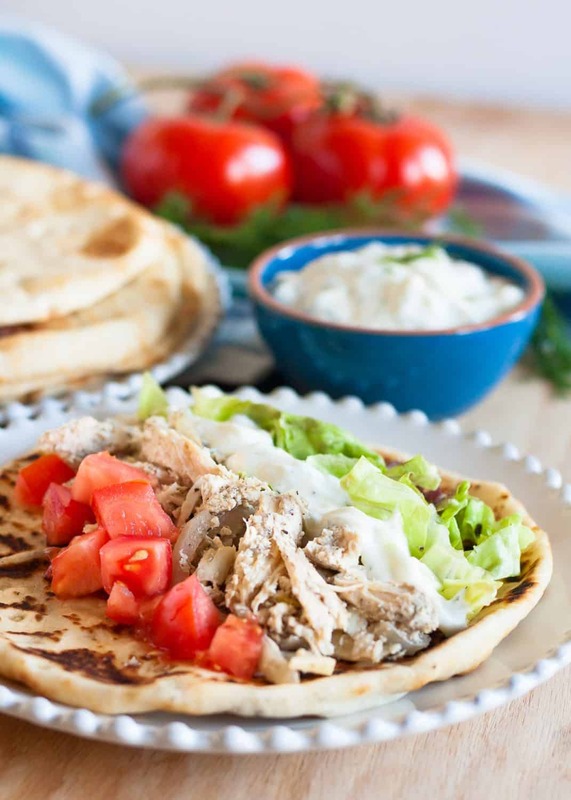 These slow cooker chicken gyros fit the bill perfectly! In fact, if you’re into the once a month cooking, you can prepare your chicken in the marinade, then freeze it until you’re ready to pop into the slow cooker. I don’t usually plan out more than a week, so I prepare mine the night before if I remember. Sometimes the morning of. 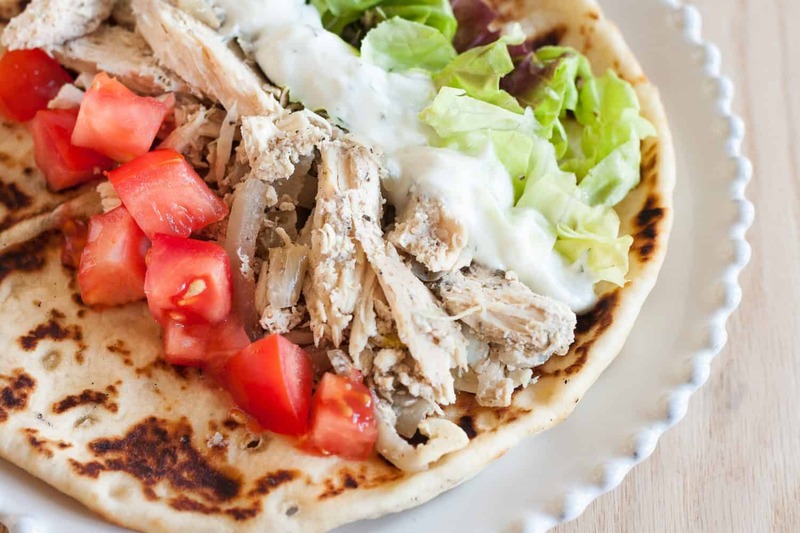 There is no wrong way to make slow cooker chicken gyros. 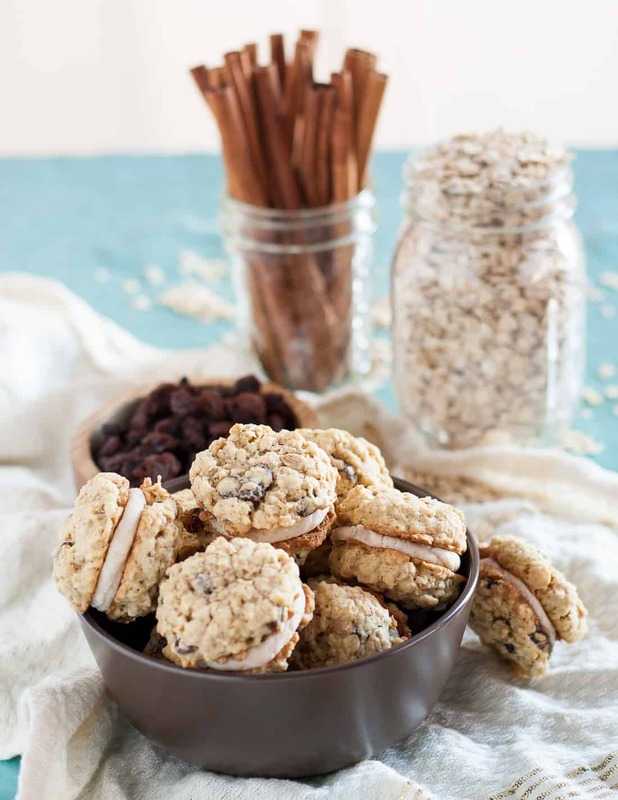 My circus loves how easy it is to tailor this recipe. Everyone gets to top their own gyro the way they’d like! We usually use a pita flatbread for a classic gyro, but have also swapped out for cauliflower rice (if we’re in a low carb mood) or regular rice (because rice), or even zoodles! The chicken is so good, and the sauce so versatile, it’s easy to serve up in so many ways. You can also make this in the Instant Pot or another pressure cooker if you’re short on time. Having tried both, I think the onions turn out a little better in the slow cooker, but that is entirely personal preference. I’ll include instructions for pressure cooker chicken gyros in the notes. 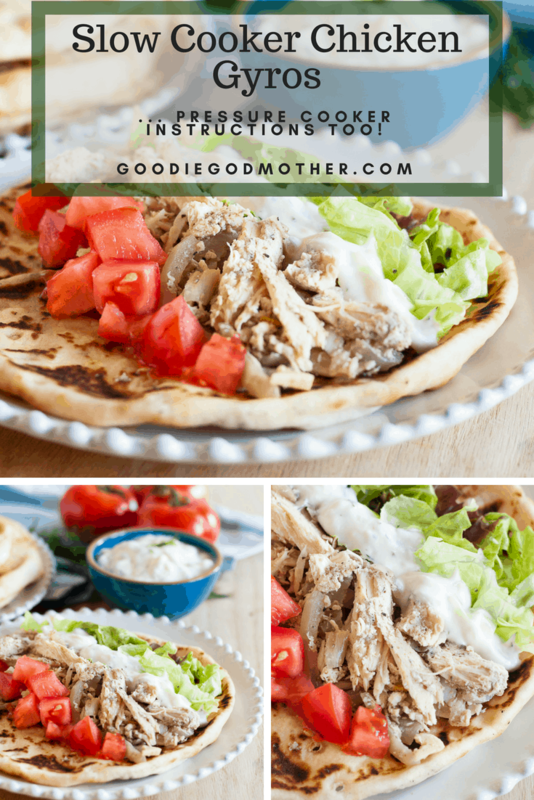 When time is short, but you need an easily customized healthy meal, make some slow cooker chicken gyros! 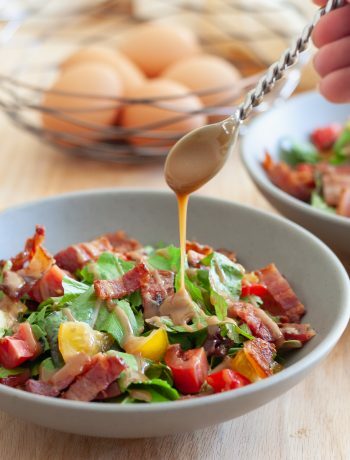 Recipe includes instructions for the instant pot too if you're short on time. Combine the chicken, onion, garlic, lemon juice, vinegar, oil, and spices in your slow cooker. Set to low and allow to cook 6-8 hours until the chicken has reached an internal temperature of 165 F and shreds easily. At some point while the meat is cooking, combine all your tzatziki sauce ingredients and allow to sit in the refrigerator, covered, at least 30 minutes before serving if possible. 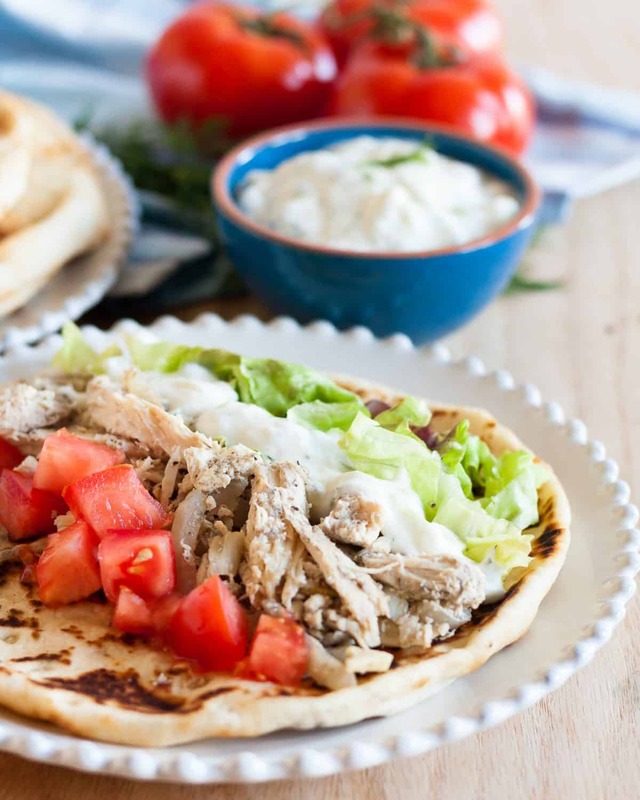 Shred the meat and serve warm with your gyro toppings. Enjoy! Combine the chicken, onion, garlic, lemon juice, vinegar, oil, and spices in a large mixing bowl or gallon-sized plastic bag. 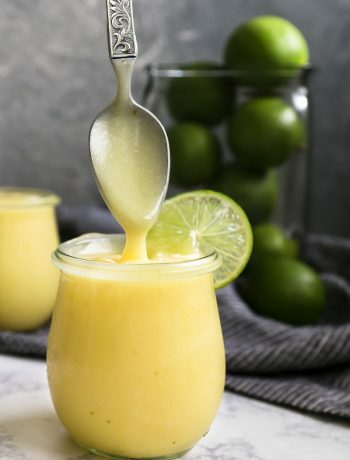 Allow to marinate at least 2 hours in the refrigerator. When you are ready to cook, place the chicken mixture in the pressure cooker. Set to high for 15 minutes. Mix your tzatziki sauce ingredients and refrigerate, covered, until time to serve. Allow 5 minutes of natural release before manually releasing pressure. Shred and serve warm with the other gyro ingredients. Enjoy!